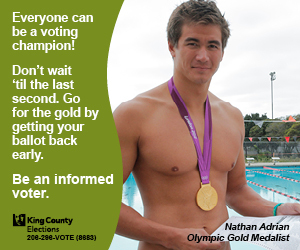 Before you throw out your junk mail this week, check the stack for your King County Elections ballot. Locally, voters will see two Seattle School District measures for the Feb. 12 Special Election, including the Prop. 1 Operations Levy and Prop. 2 Capitol Levy. Both need a simple majority to pass and both replace an expiring levy. Among the projects the levies will provide funding for is a 2017 re-opening of 19th and John’s Meany Middle School, which will accommodate the growing number of young teens in Central Seattle. The $23 million overhaul will prepare the Meany campus at 19th and John to re-open as a comprehensive middle school. Seattle Public Schools requests voter approval of an operations levy of $551.9 million in the aggregate for the three year period from 2014 to 2016. The proposed levy will replace an expiring levy. Passage of Proposition No. 1 would allow the levy of taxes over a three year period to pay for the education programs and operations and to meet the education needs of the students attending District schools. The money in and to be paid into the General Fund of the District is insufficient to meet those needs without additional funds. Programs and services to be funded by the levy include: 6th period classes at middle and high school levels; teachers and instructional assistants; textbooks and classroom supplies; bilingual and special education services; student transportation, security, maintenance and other operations; student activities, such as athletics, arts, extra-curricular and co-curricular activities; professional development and training. The total amount to be collected will be $167.2 million in 2014, $185.1 million in 2015 and $199.6 million in 2016. The estimated levy rates per $1,000 of assessed value will range from $1.45 per one thousand for 2014 collections to $1.60 per one thousand for 2016 collections. The exact levy rate will be adjusted based upon the actual assessed value of the property within the District at the time of the levy. Seattle Public Schools requests voter approval of a capital levy of $694.9 million for the Building Excellence Program, Phase IV. The proposed levy will replace an expiring levy. Passage of Proposition No. 2 would allow the levy of taxes over a six year period to pay for construction measures for earthquake and other safety projects at 37 schools, to construct, renovate, replace or make additions to 11 elementary schools, one middle school and one K-8 school, construction of building condition and infrastructure improvements and major preventive maintenance at 20 schools, and acquisition and installation of technology improvements and other capital improvements throughout the district to meet the current and future educational needs of its students. Such funds may be used only to support the construction, modernization, remodeling to school facilities or technology improvements and training. The total amount to be collected will be $115,816,667 annually, to be collected in each of the six years commencing 2014 through 2019. The estimated levy rates per $1,000 of assessed value will range from $1.00 per one thousand for 2014 collections to $0.82 per one thousand for 2019 collections. The exact levy rate will be adjusted based upon the actual assessed value of the property within the District at the time of the levy. Those who haven’t registered to vote have until Feb. 4 to register in-person. Register by downloading and completing a voter registration form from the Secretary of State’s website and deliver the form in person. Mailed ballots require a first class stamp and must be postmarked by Feb. 12. This entry was posted in Community and tagged elections by Jillblocker. Bookmark the permalink. The Meany Middle School building is not at 19th and John. It is on 21st Ave E between Thomas and Republican. As is par for the course in Seattle the tax levies are presented as simply renewals of existing levies. What’s not pointed out is that the levies also include a rate increase far above the rate of inflation. Enough increases in property taxes. This needs to stop, a different revenue source needs to be established. Homes we could afford while working our asses off, we won’t afford to pay taxes one once well deserved retirement time comes. I’ll vote absolute NO to both. Why is there so much crime in our neighborhood? More police! I’m voting “no” also. It is the responsibility of the State Legislature to fully fund schools, and we taxpayers contribute to this budget via various taxes. I’m sick and tired of these school levies, and the increased property taxes, as a mechanism to raise more money and allow the State to abdicate their responsibility. It’s time they were defeated, but this never seems to happen in liberal Seattle, and probably won’t this time either.